Comments Off on Here we sit…. while our construction crew is working up the hill for someone else! NOPE! Not done with our stuff….oh, and they took “supplies”, ie: dirt, cement, etc. that we are under the impression we paid for! Frustrated….naw, not us; more like very disgusted! Wish we’d paid $60,000 more and not gone through this frustration and agony. We are tired of living like this and want to be unpacked. Couldn’t decorate for Halloween, wonder if I’ll be able to for Christmas? On a bright note, rainy season is coming to an end! Today was another gorgeous day! Todd and Amy missed having perfect weather by 1 week, darn! ICE, power company, was working on the lines in our development, which meant, no power for us. After over an hour of it, we decided to head to the American Embassy in San Jose so I could change my address. Silly me figured since the Social Security check, (herein known as the cheese check), was direct deposited into a US Bank, and I didn’t need to change it; but I did need to get it updated. After 2 emails to Social Security in the US, I was informed to contact the American Embassy here either by phone or email. So off went an email; after waiting a month, I sent another email to the US; again was told to email them; after another month, I finally got a phone call that I would have to go to the Embassy to do it. So I can now scratch off that deed done! Stopped at EPA, Costa Rica’s equivalent of a Lowe’s, and picked up a few more things for the house. Oh, when the power went out this morning, the construction came to a halt! We can see the end in sight and it’s absolutely playing havoc with our mind on why things aren’t getting done. Getting windows here is not like going to Lowe’s or Home Depot, etc. to get pre-fab windows; here they are made from scratch. After graduating from high school, I worked in a factory that made these kind of windows; it isn’t rocket science! Just can’t figure out why it takes so long. And the “closet” and bathroom vanity are being fabricated by a woodworker; again, simple projects. It’s nothing elaborate that we are asking for, we’re just asking for them to get done. It seems that construction workers like to make the most noise in the a.m., early a.m. to make sure we’re awake; and in the afternoon they decide to paint. Which makes for a good possibility of getting a nap; however, you no more than get asleep and someone decides to turn on some loud noise maker. Personally, I’m beginning to think they are messing with my mind and I’ve just about reached my limit! LOL Like there’s anything I can do about it. If I can find a Halloween costume (that I brought), we might go to a Halloween Party on Saturday night. Mark’s on his own for a costume. 11 days and 11 nights of rain…..sheesh, go away agua! Comments Off on 11 days and 11 nights of rain…..sheesh, go away agua! Even the dogs are sick of it; they no longer want to go out and must be forced. One advantage is we can still have the windows open! Construction guys are painting inside….this much rain is playing havoc with everything! Roads have collapsed, rivers are over their banks, mud slides are plentiful; Mother Nature is pissed at something/someone and it’s time for her to get a new attitude! The sooner the better. After over 30 inches of rain these past 7 days, there seems to be a little break right now. We can actually see the lights in the valley! Something we haven’t seen for 7 days….oh, and we haven’t even seen the valley either because of the low clouds. Hope this is a good sign because our daughter and son-in-law arrive in the morning! I wonder which of us will have less sleep tonight…them or us? I’ve been wanting to write about my beautiful Cuisinart Coffee Maker for awhile now. It’s finally moved to the forefront of my mind! I did research, more research, and finally a little more research before making my decision. I knew I didn’t want a coffee pot with a glass carafe because I tend to leave it on and the coffee becomes more bitter and more bitter as the day progresses. Therefore, I chose a Cuisinart with a stainless steel carafe because it keeps the coffee warm and doesn’t sit on a “hot plate”. My beef with this Cuisinart is, I make 8 cups of coffee and I’m lucky if there are 4 cups of coffee to pour into cups/mugs. Yes, I understand that a mug takes more coffee to fill it up; however, my coffee mugs aren’t that much larger than a normal cup! I would like to suggest to Cuisinart that perhaps they make the gauge for water with just a tad more space. It would be nice to make 8 cups of coffee and get at least 6 cups! It’s raining! It rained on Sunday; it rained on Monday; it rained on Tuesday, well, you get the picture, it’s still raining; so far 6 inches today which does not include the previous rain this week. Makes it difficult for grout, paint, etc. to dry – construction hasn’t made much progress this week; it’s just so darn close to being finished! It will end, I know….just seems like it’s been a long time! Off we went in the rain; there’s a bridge you cross on this road and I’ve never seen such raging water underneath it. Was very pretty and if it hadn’t been raining so hard, there would be pictures of it. Actually, there’s been so much rain there are “mini waterfalls” along many of the roads. Went to some fabric shops, no, I didn’t buy any. I need to get unpacked and see what I brought with me; she was the one buying fabric….to make dog beds. She runs the Animal Lighthouse Shelter and is always in need of dog beds. On the way home, Mark called to warn me that it had been raining all day; power was out for awhile when it got really windy; we haven’t had many power outages since living here so far. The road we live on is gravel with some areas that are paved. The rain makes for some deep ruts; he thought I should stay in town for an hour or so to see if the rain would let up. I did need to pick up some things, get gas in the car at the only gas station in town, HA! Then it dawned on me, I’d much rather drive the road in a little bit of light – it gets dark, pitch black dark, at 6 p.m. So I headed for home. Not much traffic, I might add. There must be one area of the mountain that gets a lot of wind because there were limbs, etc. down in the road. Not the first time I’ve noticed that in this particular area. Driving along, I almost went off the road because I saw a Bufo toad in the road and the only good Bufo, is a dead Bufo. I think I got ’em! Then I started to notice a tree had fallen onto the road; glad it was in an area where I could drive around it; some spots in the road are pretty darn narrow; a little bit further another tree in the road, caused by a mini-landslide but I could drive around this one too. You know one amazing thing will be by tomorrow, some kind soul will have moved these trees so the whole road will be passable again. In some areas where there are potholes, people try to fill them. Costa Rica is a kind country! Time to call it a night; and listen to the falling rain…..
October in Costa Rica = umbrellas, boots and rain gear! Comments Off on October in Costa Rica = umbrellas, boots and rain gear! We had been warned that October in Costa Rica can be…well, quite wet! This week we have been more water logged than we anticipated; It started raining late Sunday and hasn’t really stopped yet. Monday, it looked like it was going to clear off and me being optimistic, threw in a load of clothes; let me share with you, those clothes are now much wetter than when I hung them on the line or I imagine even more wet than when they were in the washing machine. But you know what, Pura Vida, it is what it is. Will be going to a friend’s house on Sunday and using her clothes dryer to dry clothes that were washed last Monday! And I’m chuckling as I write this! Ah….rain gauge – 6 inches so far today. Now to the good stuff…..yesterday Sofi had a day of beauty; her first without her pal, Oliver. She got beautified at 1 p.m. and I had a dental appointment at 3 p.m. Very different experience for me at the dentist. I chose this dentist because his sign said “English Spoken Here”. We didn’t have much difficulty altho’ I did have to ask him to repeat things. Nice dental chair wrapped in plastic, TV in the ceiling, etc. A novella (soap opera) was playing….of course, I couldn’t understand it but it did seem to me it took place in a beauty salon; everyone, and I mean everyone in this episode was getting their hair brushed or combed! I made an appointment to get my teeth cleaned because I’m going to need some dental work done eventually. He’s quite young, out of dental school about 3-4 years. First off, he rubbed something on my gums that he kept reassuring me would be good for them; then he started the cleaning and told me that there wasn’t much plaque and he wouldn’t have to use the machine. Yep, I know, I should have said, “what machine?” He used a “pick” to scrape my teeth, like my dentist did in the US. When it came time to use the grainy grit (I don’t know if what it’s called), he actually just rubbed it across my teeth. Then he used a “dremel” (a dremel as in dental dremel). He had me swish some pink liquid around in my mouth and spit; no rinsing with water, he cautioned me. Then at the very end, he had me swishing more stuff with the caution, no rinsing. Yes, my teeth felt clean and I feel that he did a good job. Am most likely going to need a bridge on each side of my uppers. OH BOY! He said it will require three crowns on each side, 3 different appointments, for each side; each crown is $220. He also wants me to go to another location in town for a full set of x-rays, like when the machine moves around your head. That will cost a whopping $20; says he needs that to see the roots, etc. That pretty much sums up Costa Ricans…..they all want to help you! Adios from a rain soaked mountain! Construction is finally coming together…..YAY! Comments Off on Construction is finally coming together…..YAY! We chose a soft denim blue tile for the shower; the border is of brightly colored fish (which I happened to find an embroidery design just like it…meaning, we’ll have matching towels in there, eventually!) The shower floor is a checked pattern with white and matching blue from the walls. The guy in the window, Carlos, is putting on a base coat on the outside wall. 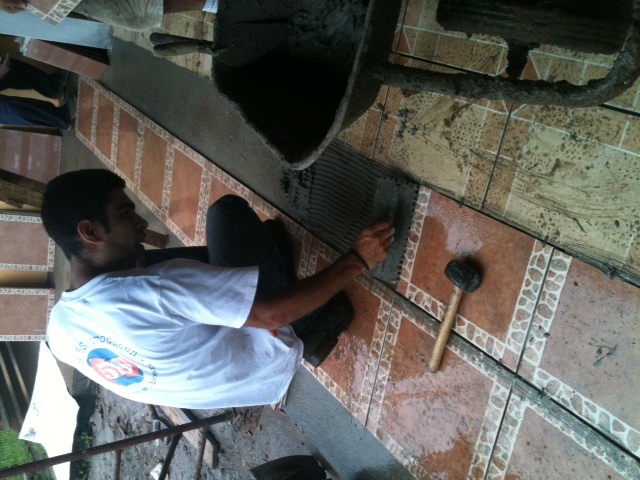 Johnny is putting down the sidewalk tile; this goes along the front of the house and the new bedroom. This is just a small section of the bedroom tile. 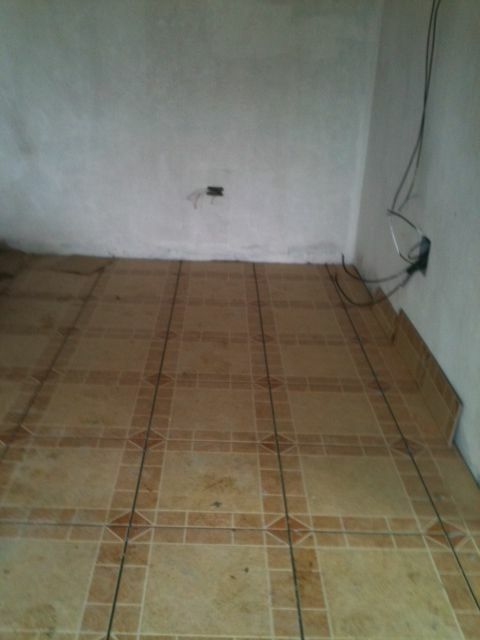 Plans are for all the tile to be grouted, if that’s a word, today. Yep, another little five letter word = plans! 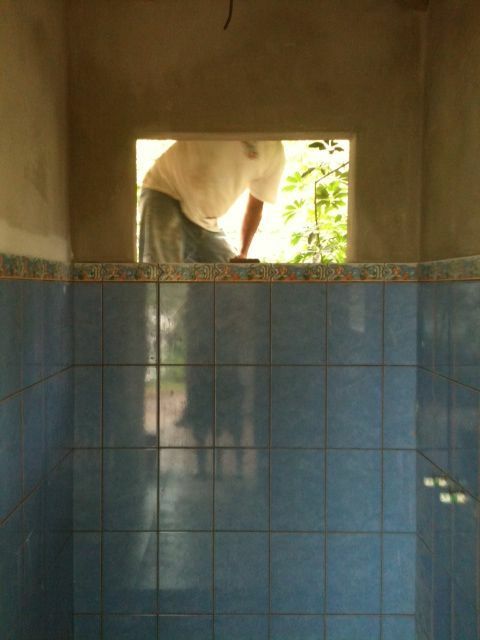 Adios for now….keep your fingers crossed that the bathroom fixtures are installed and the windows installed this week. LOL!